The Robert W. and Elva Faison Safrit Historical Center is located on the Beaufort Historic Site at 130 Turner Street. 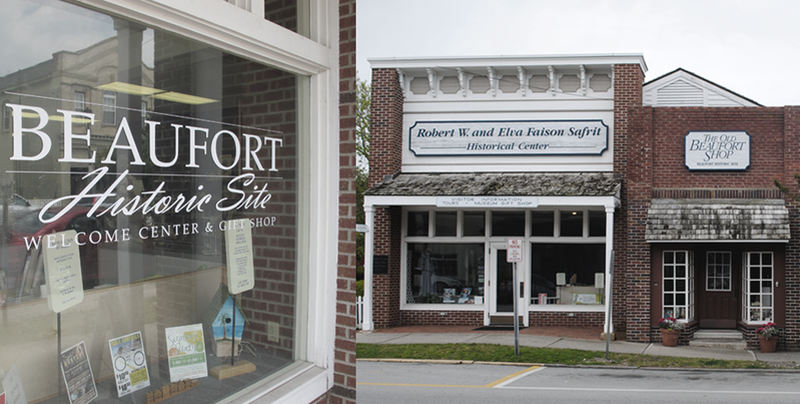 A part of the town’s National Registered Historic District, the Safrit Historical Center also serves as the Visitors Center for the Town of Beaufort. The helpful and knowledgeable staff and volunteers can answer all your questions whether it’s a place to stay, places to dine, or the best ways to experience Beaufort and the islands right outside our door. The Old Beaufort Shop, located in the Safrit Historical Center, welcomes visitors to browse for gifts, books, and souvenirs as well as many handmade items from local artisans. The Old Beaufort Shop truly offers something for everyone– from toys, books, crafts, and jewelry to pirate attire and colonial dress! The Shop also sells handwoven items created on site by the Warped Weavers. Proceeds from the Shop go towards the preservation and education programs at the Beaufort Historical Association. Don’t have time to stop in? Take Beaufort home with one of our items from the Online Shop!